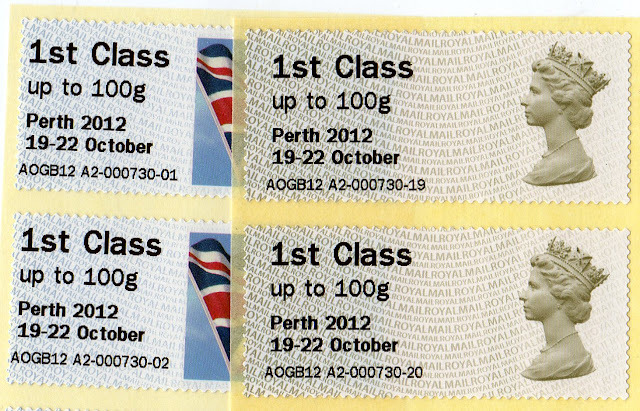 Thanks to Richard I was able to post last Monday the pictures in the previous post showing both the Machin Head and Union Flag stamps with the Perth overprint from the Hytech version 2 machines previously used at Stampex. As you will see, these are matching strips, the stamps being numbered 91-96 in both strips, from sessions 635 (Machin) and 616 (Flag). Because Richard was buying in quantity and as Collectors Strips (ie multiples of 6) I didn't realise then what I deduced when I received my own stamps from the organisers. The receipt shows Machine number A2, session 730, and stamps from Reel and Reel B, leading me to the inevitable conclusion that the machine had, as well as a reel dispensing Post and Go Labels (for immediate posting), two rolls of Faststamps. Examination of the stamps shows that they have follow-on numbers in the same session. My Flag stamps are numbered 01-18 and the Machins 19-36. I don't think any of the eBay sellers has, in the same lot, listed different stamps with the same session number. I don't think it had been mentioned anywhere else until I asked around, and Brian has now provided full details on his postagelabels.uk blog. C = Cattle, F = Flag, F-DJ = Diamond Jubilee overprint on flag. I wonder how many people actually bought different stamps with the same session number at Stampex? Probably few. Certainly I've not seen any sold with that mentioned. As an identifier it is of little consequence as the new format of the coding on the Version 2 machines is sufficient. 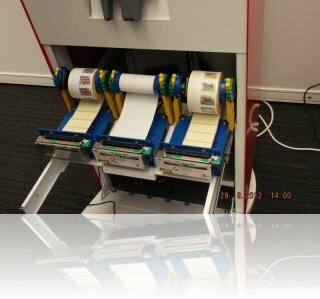 But when these are introduced into Post Office branches to replace the Wincor-Nixdorf machines, it will present additional opportunities for Post Office to offer a wider range of labels, either pictorial/non-pictorial or maybe normal and 2nd class as currently 2nd class is only a 'Post Now' option on Post and Go machines. Pairs of these stamps now on sale on our shop, as well as FDCs. We now have no stock of the Perth overprints. I doubt if anybody kept a record of how many 'sessions' there were, although you could monitor this by surveying the eBay sales! I know one dealer is said to have spent around £3000 and another £700. The organisers had orders for more stamps than they could supply, so much that I was asked to shut-down the offer on the original blog post and say so! But even then, a 'session' (as indicated by the number 730 on mine) could be anything from 1-16 collectors strips (some of each stamp or all the same) or 1-99 1st class stamps (ditto). So even if you know how many sessions there were, by monitoring the highest number seen, you won't know how many sets/stamps within those. I think possibly the machine A2 did not start at 1 but continued from Stampex i have an example of A2 bought at 11.55 on the 29/09 the session number is 524. The engineer went home at this point so if the machine failed that was it. See if anyone has any session number before 524. 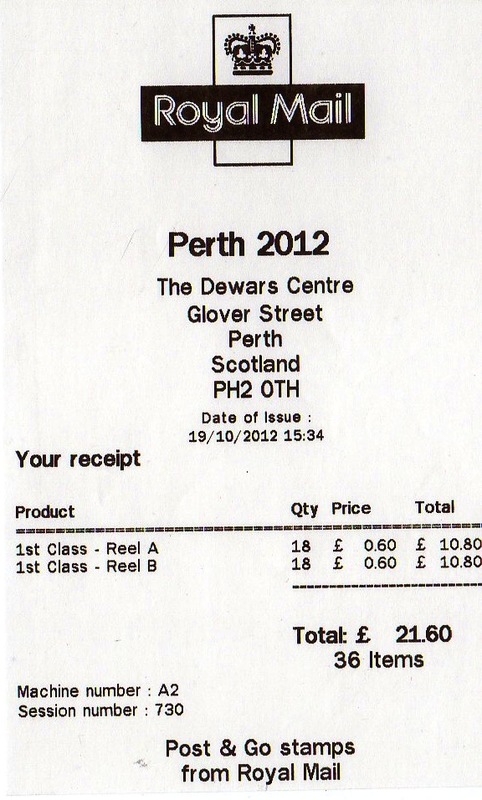 730 on the 1st day of perth is a very high number.